The May 2012 I&A is being distributed. And there was much rejoicing. As is usual, this will take a few days. The first people on the list will get the e-mail today, everyone else either tomorrow or Thursday. Here's the link to download the January 2012 issue. Whenever a new one is released to subscribers, I'll make the previous issue available here. OK, so after talking with Comcast and Terraserver, the issue is...neither of them! If I take my computer and plug it directly into the modem, Terraserver works just fine. But if I try and get the site running while using my wireless connection, it doesn't. So, nobody was blocking anything, the problem lies with the wireless router. The question now is, does anyone have the slightest idea how I'm supposed to fix this now? I've logged into the wireless router's control panel whatever thing (at this point you should be able to easily discern my level of computer knowledgeableness), and can't find anything related to what I need to fix. The problem is that Terraserver is pulling map data from tsms.terraserver.com, and that is the linkup that I can't make for whatever reason when using wireless. This is all slightly weird as it happened all of a sudden, but whatever, the site does work when I plug right into the modem so we've basically eliminated my ISP and Terraserver from the equation. So, what am I supposed to do now to get this cooperating with my wireless router again? Ideas? It appears that Terraserver obtained updated imagery for a good part of the world a month or so ago. Being that I was off in my own world at the time, it's not a shock that I didn't catch on to this before. There are a lot of places you can now examine using their online viewer﻿ that are not yet visible in Google Earth. Plus, they seem to have a much bigger collection of historical imagery now as well. It also figures that they seem to limit the number of searches you can perform now. I've been messing around with the viewer for around an hour or so and all of a sudden it won't complete any of my searches. Clearly I need to just subscribe already and get the nicer viewer! 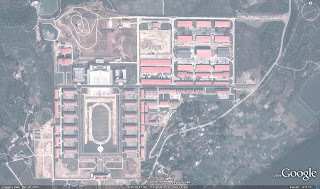 The previous two Google Earth imagery updates haven't disclosed anything overly amusing, but they have included updated 2012 imagery around Shaoguan in southeastern China. 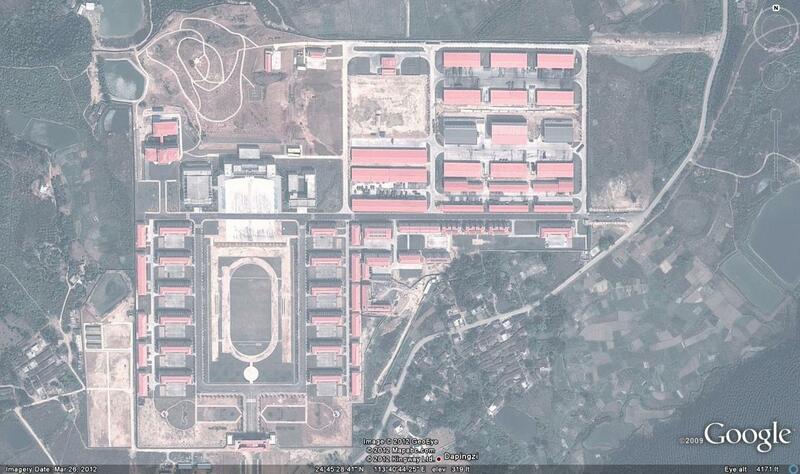 Shaoguan is the home to the PLA 2nd Artillery Corps' 827th Brigade, and until now the brigade facilities remained unlocated. The image above depicts the probable HQ compound for the 827th Brigade. The compound shares various features with other PLA 2nd Artillery Corps garrisons, including the obligatory high-bay garage and various smaller garages for launch vehicles and support equipment. As a newer unit in the 52nd Base, the 827th Brigade compound is nonexistant in October 2005 imagery. This is logical as the 827th represents a newer unit. Some sources suggest that the 827th Brigade is a DF-16 unit, while others suggest that the Brigade operates the DF-21C. The DF-16 is reportedly the new designation for the former DF-15C, a two-stage DF-15 modification. According to a news piece posted by AOL, Google is developing the ability to track and display the locations of ships at sea. Well, at least those actively using AIS transponders, but still. This is a pretty interesting development, if you ask me. Some of the benefits are obvious, and are mentioned in the article. Then there's the fact that you could theoretically track the movement of military forces worldwide. Provided they operate with AIS transponders active, that is. I'd think that this represents a great tool to exploit off of the Horn of Africa. Military vessels in the area with transponders active could act like homing beacons for shipping in the area, guiding them through protected waters and serving as a pirate deterrent. The authors naturally assume that such new technology would obviously represent some sort of terrorist tool for attacking targets (because what else is Google Earth but a mapping program of terrorist targets, right? ), but if American, Chinese, or whoever's naval units are operating in the clear, hey, go ahead and try it. I'm willing to bet that in the battle of terrorist vs. 5 inch round or terrorist vs. CIWS, the winner will not be the guy with nefarious intentions. Plus, in case they haven't noticed, terrorists and pirates are already attacking boats. The really interesting bit of the article is Google's plan to map the entire seafloor in high resolution over five years. Again, the assumption is that this will lead to all sorts of security problems when crashed spy satellites are located and the Chinese or Russians go out to lift them off the bottom. Always with the negative waves, Moriarity. Always with the negative waves. Me, I'd like to see them locate Jack Weeks' A-12, to finally put an end to one of the unsolved tragedies of the CIA's OXCART program. Of course, locating K-129 would be amusing too...we'd then know just how much of the sub was lifted off of the bottom by the CIA. I'm not sure which would be more amusing, finding only a few pieces of the sub on the bottom, or the entire thing. The article closes with the following line from an unnamed intelligence community source, after a brief bit about how Google services have little intelligence utility whatsoever in their minds: "Just because you have the data, doesn't mean you can analyze the data or know how to use it." And see? I told you I'd be posting here again. Sorry for the protracted absence, I got submerged by various projects and they pretty much demanded all of my focus for the past few months. That being said, all of those projects are now over and done with. I've also cleaned out my schedule for the remainder of the year. Bottom line: from now until at least January 2013, I get to concentrate exclusively on the website, I&A, and a few other things. Well, I'll still be teaching, but that's never been a huge encroachment into my other areas of focus anyway. So. What's the plan for the rest of the year, then? I'm going to be focusing on three areas. We'll call them three tiers to make it sound formal and organized. Tier 1 will be the website. I want to get back to putting content here on the web. It won't be as in depth as it used to be, ebcause I&A will still be the primary monthly source of information, but there are some things I'll be doing here. Anything opinionated will go here for obvious reasons. In addition, I'm going to start posting anything of interest that pops up in Google Earth's imagery updates. The only caveat there is that I've got to wait until they push out the KML for a given update, so I can fully investigate all of the new areas to see if there's anything interesting that is now visible. They can sometimes take a while to get the KML out, so don't expect to see something here the minute you see new imagery. The SAM Site Overview will continue to be updated as well. And, like I did during the Libyan bombings, current events topics, or pretty much anything else I find amusing, will go here as well. Tier 2 will be I&A. If the website is the personal outlet, I&A is the semi-professional outlet. I am now armed with Microsoft Publisher, so I may even be able to finally get around to tweaking the layout. Beginning with the May issue at the end of the month, I&A will now return to its regular monthly distribution schedule. I'm going to put a bit more effort into getting things lined up in advance as well, particularly from contributors, so the turnaround time for each issue should lessen. That in turn should further increase the chances that I stop with all of the irritating delays in getting things distributed. Also, the fun things that I get into for places like Air Power Australia also fall into this category. Tier 3...this is the professional-grade material. I don't expect there to be much of a difference in scope or quality from the aforementioned material, the difference here is that this material will not be available on the web or in I&A. That's right, I have invaded the publishing world. One of those projects taking up my time the last few months was my first professionally published article. The May issue of Jane's Intelligence Review features an article penned by...me! I'll be doing more with IHS Jane's in the future, and looking for other media outlets to invade as well. And yes, I am now referring to myself as a professional author. So that's the plan. I'm now going to be focusing pretty much exclusively on all of these areas, at least until the rest of the year. After that...who knows? And I do have to thank IHS Jane's for allowing this to happen. Being able to convert my brainwaves into cash money is the driving factor behind my ability to ignore everything that doesn't involve my teaching job, which I like too much to get rid of anyway. -May's issue of I&A. Expect good stuff here. I've got something in the works on Russia's CVLO radar network, and am rewriting and updating the Blackbird reading list featured here a good long time ago. -Imagery Update Highlights from the two May updates in Google Earth, the second of which happened a day or so ago. Right now I'm waiting for the KML to update displaying the new imagery and everything will be good. -Updating the SAM Site Overview files. I've got new files ready for upload, they'll probably wait until the weekend just to allow this post to sit at the top for a couple of days. The current total is just over 7200 sites. And of course, as I log in to post this, I see that Blogger has changed its layout and format. Bear with me for the next couple of days as I get used to the new system.